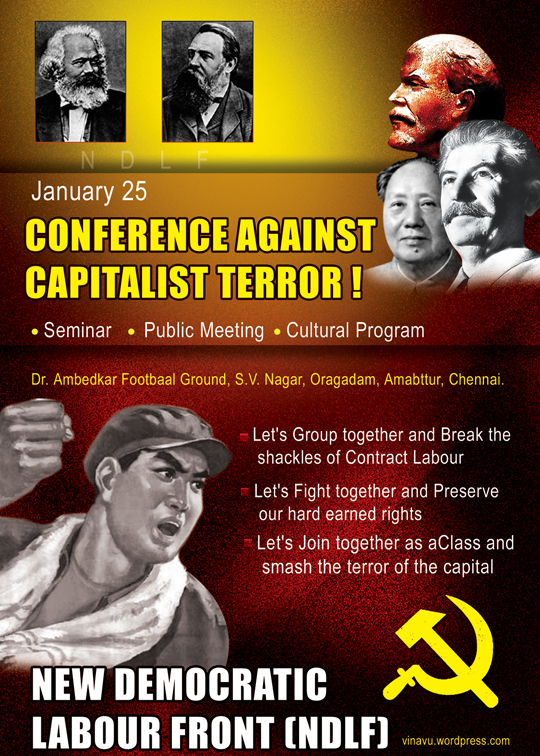 Back அரசியல்/சமூகம் CONFERENCE AGAINST CAPITALIST TERROR! Can we proudly proclaim ourselves to be the working class? We are forced to live at the mercy of the capitalists for our job, wage and livelihood. We are the working class hat created this world with our blood, and move the world with our sweat, yet our life remains pathetic. All the hard won rights of the working class merely remain in papers. Even such formal rights are snatched away from us one y one. Right to form trade unions, right to regularizations of employment, right to benefits like ESI, PF.. all those rights are nowhere to be seen. We have faced immense hardships, oppression and many of us have lost our livelihood to win those rights. Yet they’re gone. Eight hour work day is the law. But 12 hour work is the norm. The moment you demand a reasonable wage, you are thrown out by the employer. Yet we can’t raise our voice, but bow down to accept the measly wage for fear of losing the job. We live a life worse than a bonded slave. The government boasts of opening a factory everyday and offering employment to thousands of people. How many of us are getting a permanent job? Ninety out of hundred of us are contract workers. The employers are laughing away our claim for permanent jobs as fables of the past. Yes they are. Many of us start working at the age of 20, squeezed out and thrown away at 35 and are replaced with young blood. The worn out workers have nowhere to go. They end up joining some security agency, standing at the gates, saluting everyone. We meekly submit, with our hearts writhing in pain. On completion of 480 days of work you have an entitlement to permanent employment. That is law. But you have to prove that you have worked for 480 days. The onus of proof lies with the worker. And if one attempts to prove, he is bound to loose his job for ever. Nowadays workers have only heard of privileges like ESI and PF but nobody enjoys them. No claims could be made even if a worker dies at the work place. Right to form a trade union is our hard won right earned through valiant struggles 80 years ago. But today a mere proposal to form union in an industry is enough to force a worker out of his job or close down the factory. An attempt to form a union has nowadays become a punishable crime, to be dealt with by the police. But the capitalists form their own associations. Ministers are at their beck and call, and their resolutions are in no time made enactments by the government. The government holds consultations with the capitalists before finalising the budget proposals. Tax exemptions and subsidies are offered in a platter. The demands of the tax evaders are honoured. If profits go down the capitalists are compensated with subsidies. The word of the capital becomes the law of the country. But the state never pays heed to the great mass of the workers, more than 30 crores in number. Even with regard to the issues of the working class, the government does not care to consult with the trade union leaders. The PF money of the working class to the tune of 2.5 lakh crores, was offered by the central govt. to the stock market gamblers - ICICI, HSBC, Prudential and Reliance. It was our savings, yet, the govt. did not care to seek the permission of the working class. In fact we were deprived of our money despite our protests. How much more can anyone be denigrated and humiliated? The government holds talks with regressive casteist and communal elements. But this is how the government pays regard to the working class that moves this country with its blood and sweat. The management of the Hyundai had the audacity to pull down the flag mast of the trade union on a may day. Could this be done to the flag of a caste organisation or a mere cinema fans club? Even the demolition of a roadside temple evokes protests. But our blood did not boil even after hearing about the humiliation to our flag, the flag of the working class. Many of our comrades have faced the retribution of the employers for attempting to form labour unions. Many have lost their jobs. Many more have committed suicide in Binny mills, Dunlop, Metal box, Standard motors etc. Have we ever cared to feel that all these workers belong to our class? Have we ever been distressed with the feeling of their pain? Did we ever agitate? If we had, they would not have died unheeded. If there is a caste conflict in one corner of the state, buses are burnt in another corner. Communal elements could incite riots from Kashmir to Kanyakumari for issues like Ayodya, Amarnath and Ram Sethu. But here in Tamilnadu, in Chennai, in our neighbouring industry we witness the injustice meted out by the workers, yet we remain mute. We feel that its not our business. We think that we are permanent workers and hence do not care for the contract workers; We think we are organised workers and hence do not care for the unorganised workers. We don’t feel for our own class, for, we meekly accept the divisions and sub divisions imposed on us by the capitalists. If the victim is him today, it is going to be me tomorrow. This had been our experience. This is the rule. Yet we don’t realise this truth, the truth that we all belong to a class. Hence we could not understand our own strength, the strength of the united working class, before which the capitalists would be forced to surrender. We are being treated as voting machines by the electoral parties. For the capitalists we are human machines. The voice that always pleads, and the class that always fears has never won its rights. Unity and struggle likewise has never lost in the fight. If thousands and thousands off labour hardened hands of the working class join together, even the iron fortress of the capital could be smashed. Let’s join together as a class and smash the alliance of capital with the state! January 25, Dr. Ambedkar Footbaal Ground, S.V. Nagar, Oragadam,Amabttur, Chennai.